One of the ways I defined myself in middle school was writing timed, rhymed poetry on a topic chosen by a peer. Me classmates considered it something of a superpower- a handy party trick I could pull out at a moment’s notice, often using the topic itself as an acronym that began each line. They would then take a copy of the poem for themselves, sometimes even place bets on whether or not I could complete a piece, say, on leprechauns in three minutes. I earned my fair share of quarters and acclaim. 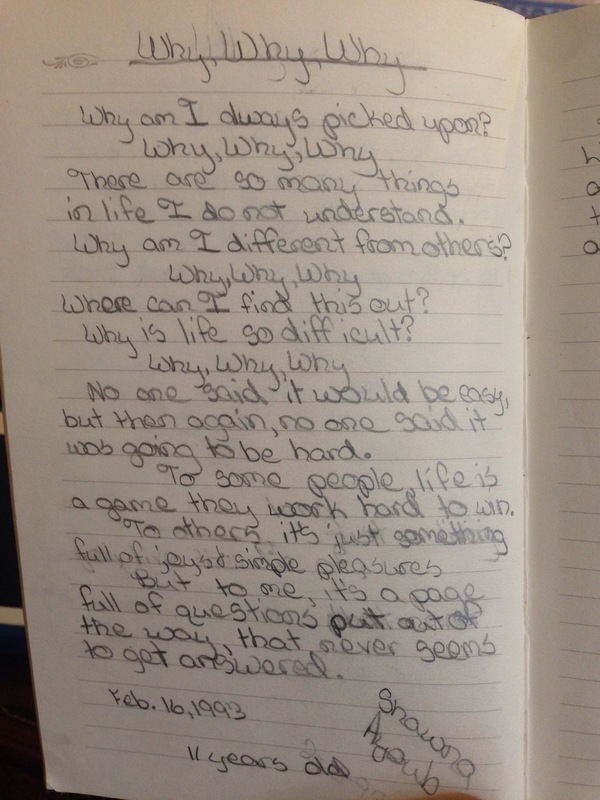 This never propelled me into a space of social acceptance outside of, “Shawna is the one who can write.” The pieces I jotted were pure whimsy. I know. They are all hand-recorded on journals upstairs. I treasured each piece for the attention it brought me, those rare shifts away from the question of what I was to the measure of what I could do. I wrote odes for boys to give to girls. I wrote stories. Everyone wanted to be paired with me during the creative literary assignments in our English classes. I was happy to elbow them out of the way and rub the show, doing my work down here and there to include empty statements about the love of basketball or glorying reflections on parent-worship. Heck, it was a small state, as I came away with several state accolades for both writing and grammar despite that I can’t edit a sentence. I won monetary awards, was prized by the school system, loved by English teachers, but not enough for them to step in when they saw me tormented by the same peers who would pay for my written words to pass off as their own. They’ll stay your friend for sure. And then they let you fall. Intelligence will set you apart. Ethnicity will keep you apart. I spent my childhood fractured. My skin was too dark, my religion wrong, my hair too thick and wild. I was too beautiful, but I was also a monster, and so I learned to hate myself, but not in the ways my town intended. My peers were little more than parrots. They taunted me constantly for being less, less because I was more. They instilled in me a hatred for White, which was quite the opposite of their intention. They taught me that anything is better than plain, vanilla, blank. And when I moved away, I carried with me a certainty that I was not White and never could be. I found others whose skin were mixed palettes, blacks or browns. I tried to immerse. But, despite being told in no uncertain terms that I was a hard and firm “Other,” that too was rejected with a change of physical place. I was left facing a strong distaste for anyone bearing the color of my tormentors, and struggling to find my identity when I was summarily lumped into the offending category of White.